hiring in the US (bad payroll data) might be due to a backdraft from Chinese economic uncertainty and market volatility. 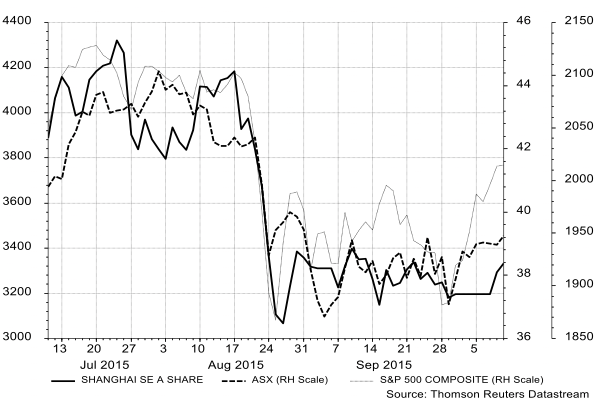 From a fundamental perspective, heightened sensitivity to the Chinese economy is nothing new for Australia. Booming Chinese commodity demand had bolstered the “lucky country’s” terms of trade for years on end, providing Australia a generous buffer in times of crisis in other developed economies. 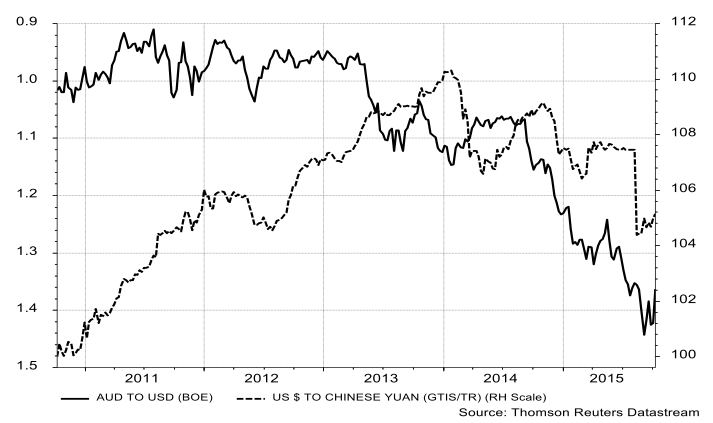 Once Chinese final demand started to sag, terms of trade slumped (see Chart 1), weakening the Australian dollar even before Chinese officials allowed the RMB to devalue (see Chart 2). The Australian dollar’s drop might have been one of the offsetting factors keeping conditions upbeat even as commodity prices slumped further. Also assisting in keeping sentiment afloat for Australia: improving conditions elsewhere (in the US and Japan, for instance), plentiful global liquidity (of support to higher-yielding assets in Australia) and demand for alternative sovereign assets as investors fled crisis-beleaguered Europe. The recent bout of market volatility, finding its root in China however raised questions among market participants whether the soundness of internally-led US domestic recovery was indeed immune from events overseas (see Chart 3). That the US economy might have been influenced by the behavior of domestic market players in China is decidedly not a historically predictable market factor. It is possible instead that inter-connectedness among global economies and markets is intensifying, and if so Australia may not continue to benefit from divergent economic recoveries among the world’s largest commodity-consuming economies. Indeed, the Reserve Bank of Australia has cited among its chief motivators for keeping interest rates at record lows the need for Australia to diversify investment away from mining as Chinese investment growth slows (see Chart 4). The trouble is however, although investment in the mining sector has stalled, recovery of investment in other industries appears extremely slow to recover, (see Chart 5), even despite accommodative financial conditions and a weaker Australian dollar. This is a worry, considering that Chinese policymakers have, as a stated priority, the policy objective of slowing the contribution of investment versus consumption to GDP growth. 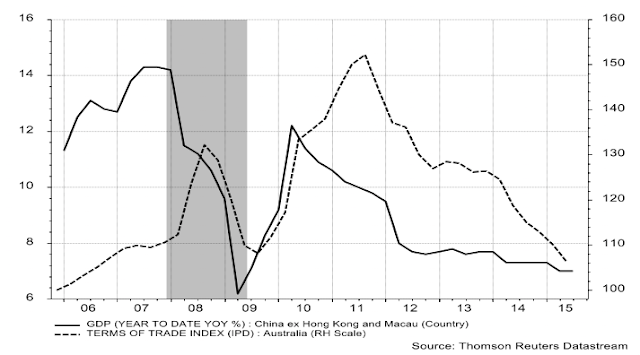 Although as we see in Chart 4, Chinese consumption remains worryingly sluggish, Chinese policy objectives imply that we should be getting accustomed to the “new normal” of slower yet more broadly based growth; Australian investment patterns show sluggishness in adapting to these new conditions in Australia’s chief export economy. 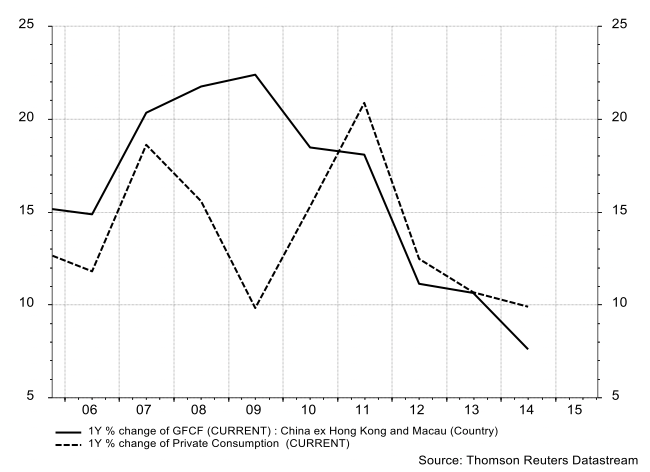 The implications of China’s “new normal” go beyond strictly industrial concerns, however. Australian investors, particularly long-term investors such as superannuation, typically focused more on domestic and developed country assets, might suffer even lower investment returns should they fail to incorporate these changing market dynamics into their portfolios. This could require such investors to shift their investment strategies, firstly to assume a more active role in monitoring developments in China and other emerging markets, and secondly to diversifying their portfolios as to protect pensioners’ future purchasing power. Simply eschewing these markets in favour of developed country assets might not provide the risk buffer that it once did, given at the very least perception among market players that Chinese economic and market developments have grown in global influence.